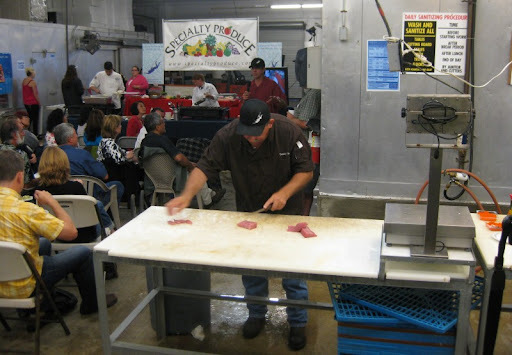 This past Sunday we attended the latest Collaboration Kitchen dinner - a monthly event at Catalina Offshore Products. 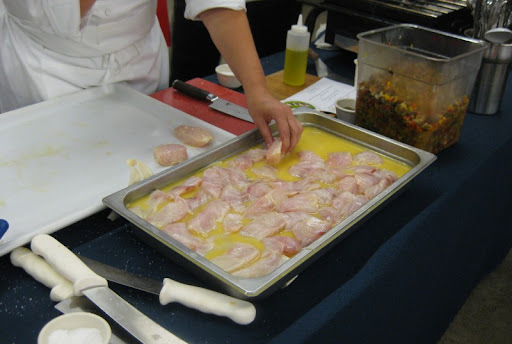 The "collaboration" is between Catalina (who provide the fish), Specialty Produce (who provide - you guessed it - the produce) and a guest chef who does the cooking. 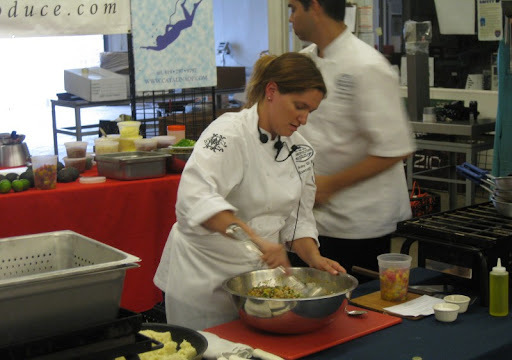 This month the chef was Amy DiBiase, who is now the executive chef at the Cosmopolitan Restaurant in Old Town. 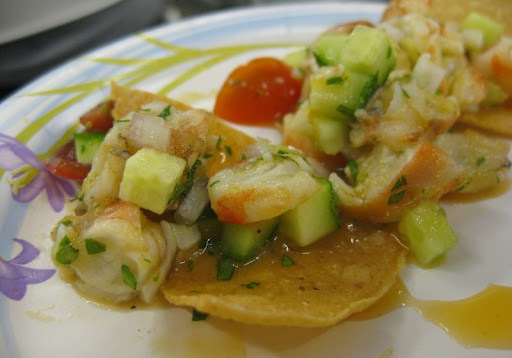 The first dish she and her sous chef prepared was a shrimp ceviche. 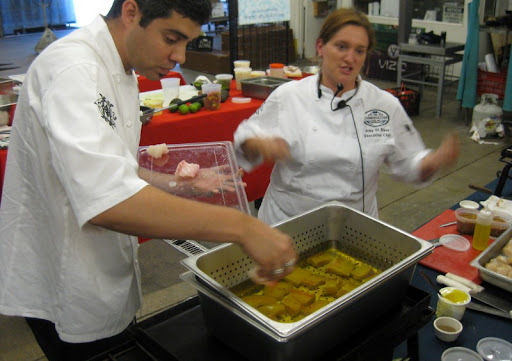 Unlike many shrimp ceviches which pre-cook the shrimp, this dish was only marinated - but for a longer period of time than is typical. This gave the shrimp a softer, but very pleasant texture. Persian cucumber added crunch, and orange juice and pureed melon rounded out the flavor. 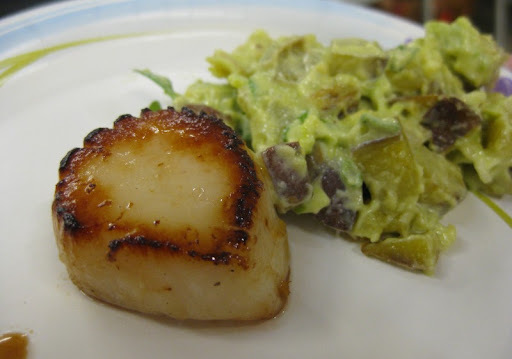 We've gotten these scallops before (see our Dishes with Fishes post from a few weeks back) and they are fantastic. 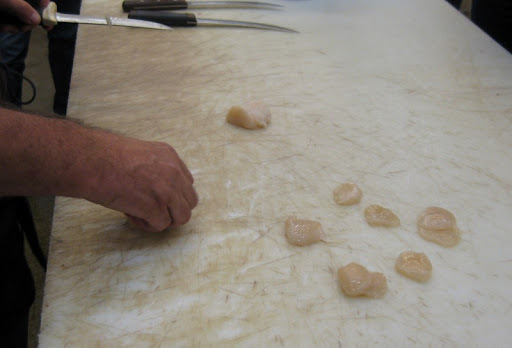 We've done a nice ceviche with them, but had never had them raw before. It was fantastic - even without any seasoning. 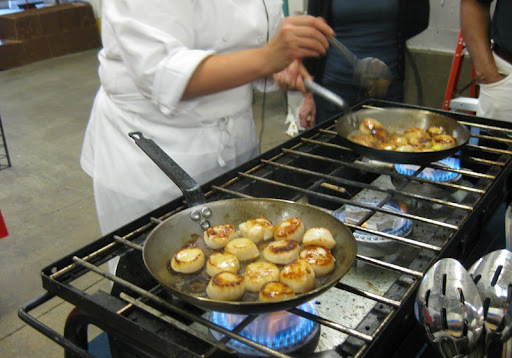 Perfect cook on the scallop, and the potato salad was very good as well. 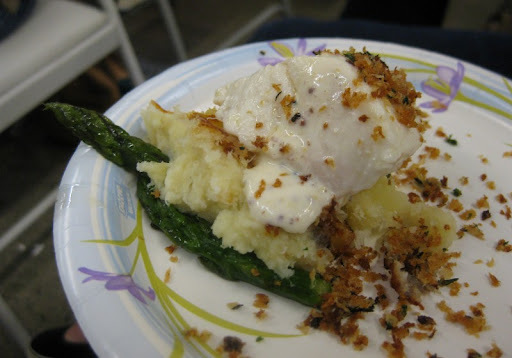 It was served with asparagus, and plated on a brandade and topped with a cream sauce and toasted panko crumbs. The yellowtail was good, but he also cut up some sushi-grade halibut which, drizzled with some soy, might have been my favorite single bite of the evening (sorry, I didn't get a picture). They served the grouper with caponata (which was light on the capers, thankfully). This last dish was probably our favorite. 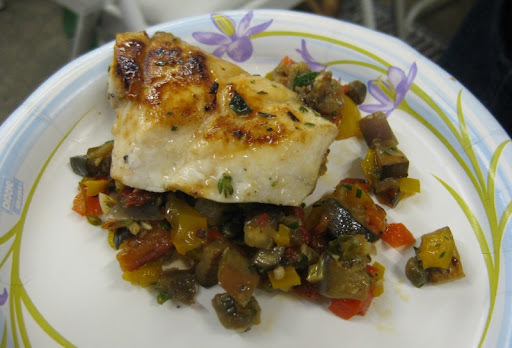 The grouper was cooked perfectly and the caponata went with it very well. Overall it was a very fun experience and a fantastic meal. 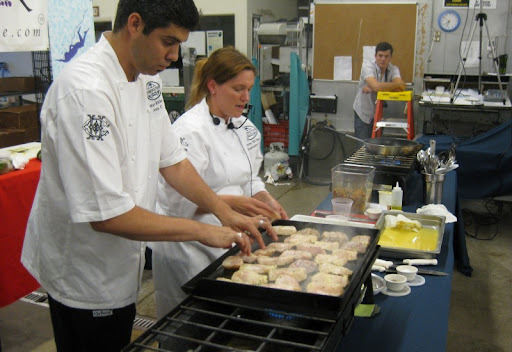 The Catalina team were great hosts and Chef DiBiase and her sous chef did an impressive job of putting out four stellar dishes for about 60 people in just two hours time. Her restaurant may well be worth braving Old Town for. wow, sounds like an amazing and fun meal. how do you find out about these kinds of things? i read on their facebook page that it was $25? that's a bargain ! 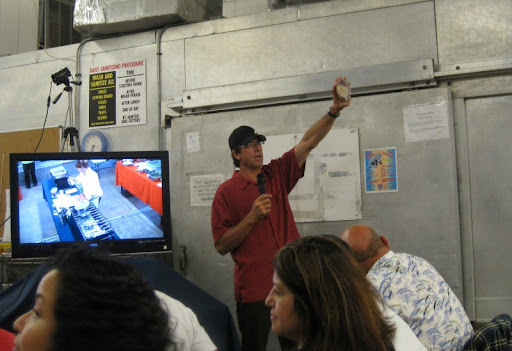 Hi Sawyer - we found out about this event from the folks at Catalina Offshore. We buy fish from them pretty much every week. That looked like an awful lot of fun and good eating too! Hi Grazor - it was definitely a great event. That sounds like so much fun! Do they give you any handouts when you go (i.e. the recipes, etc)? I will definitely check them out and hopefully make it to the next event they have. They did publish the recipes after the event. You can find them here.